Thanks again for being so patient. There's only two of us, and lately our lives have been hectic. We do plan on subbing the rest of B-Daman eS, so don't think we've forgotten about our fellow B-Dafans! However, don't expect any timely releases. We're trying to get them out as fast as possible, so keep checking back for updates! First, let us apologize for the delay on episode four of B-Daman eS. We can give a million excuses, but just know that we have been trying to find the chance to work on the episode. These past few weeks have been a bit busy, but it should definitely slow down. We hope to get out episode four soon, but just so everyone knows, we'll be taking Thanksgiving weekend to try and pump a few episodes out. We should have some time then, and we hope to get on some sort of schedule for everyone to enjoy the episodes! We finally got the chance to finish up episode three! Here's the download link for the torrent, or you can watch it streaming on our YouTube page as usual. We will also be offering a direct download from now on, which you can find in the "How to Watch" tab under "Cross Fight B-Daman eS." We're going to start working on episode four this weekend. Thanks for being so patient! Thanks to everyone who participated in our poll and survey for the past few weeks! All of your feedback was very helpful. It has to do with translation of honorifics. It's a very interesting topic, and we would appreciate your participation! Longer Release Time with little/no typos and better quality raw and subs! Please realize that although the majority wants a literal translation, sometimes a literal translation makes it difficult to understand the story, plot, and subs. If this is ever the case, BeTheMan holds the right to use an adapted translation (second place for the survey) rather than a literal translation. We promise this will make your B-Daman eS experience much better in the long run! We will be using your responses to further develop the way we release our videos and subbing methods. So please take part in our new poll so we can continue to grow as a subgroup! Thanks to all of everyone's support, we decided to go ahead and get a domain for our website. In case you haven't realized, you are currently looking at bethemanfs.com! We are so proud to have met so many nice B-Dafans, and we hope you continue to support us as we go through B-Daman eS! And just an update on episode three: we have started translating it already. We had a busy week, so there was a delay in starting the translation. But we have finally started, and it should be completed soon! Check back often for any updates on B-Daman eS episode three! Release: Cross Fight B-Daman eS Episode 02 Subbed! Also the mystery raw provider is........ Mana Raws!! Thanks again to Mana from Mana Raws for providing us with the raw for this episode, and his insight in general!! You can visit him at the B-Daman Wiki, the link is in our Affiliates section on the right of the page, or you can go here. Please let us know how you like the new style of subs. Be sure to give us feedback! Possible Release on Friday. Maybe. Just Maybe. This week was a bit hectic, so it looks like B-Daman eS episode 2 will be released sometime this weekend (possibly Friday if D NES and Skypi translate like madmen and suppress any bodily functions and hunger pains). Thanks to D NES's diligent studying, the subs in this episode have improved since episode one! But because we started with a new program, D NES had to take some time away from translating in order to learn how to use it. Skypi also had to take some time away from translating in order to study for an exam (which was today, and was easy as pie). The episode also has a lot of technical explanations, so that was taking us a while to get through. However, we've gotten through the worst and D NES and Skypi are back to having oodles of translating time! Check back on Friday for a possible early release! Optimism is key! Preview for Episode 2 Subbed and Uploaded!! I was subbing episode 2 and stayed up a little later to finish this for everyone :) So enjoy!! We will start subbing the episode ending previews for the rest of the episodes. Typesetting has been done, it took a bit longer than usual, but we will try and have the episode out before the weekend. To anyone who is interested, we picked up a new subbing program that we’ve heard good things about. A few of you actually recommended it to us! So D NES has been learning all week how to use it effectively, in order to provide the best quality subs to B-Dafans. We have also found a new raw provider, who has been very kind to us and has answered our many questions. We promise that the next episode we release will be of great quality and subs! So please check back to see who our mystery raw provider is, and whose name will be revealed when we release the episode! And a quick reminder, if anyone hasn’t done the One-Question Super Short Awesome Survey in the previous post, right now we’re tied at Literal translation and Adapted translation. The next vote could be the tiebreaker, so more participants would be appreciated! Here's the link to the One-Question Super Short Awesome Survey! Thank you for all the feedback everyone has been giving! It's been extremely helpful in perfecting our techniques! We've been getting some suggestions and requests about the length of the subs for future episodes. There have been a few people already who have asked if there's any way we can try to shorten the length of the sentences since sometimes they tend to wrap around the screen (we are very aware of how long some of the sentences were, and we're sorry! We were trying to keep it short, while still using all the key words said in the Japanese version, but it still ended up being a bit long). So we wanted to remind everyone that we still have a survey up, asking about translation preferences (loose translation verses literal translations; short subs verses long subs) and we'd like as many people as possible to participate in it! It's only one question (you're welcome! ), multiple choice, and it really would allow us to figure out which method the majority of B-Dafans prefers for future episodes. Little interesting fact: Skypi is a certified ethical researcher! Because of this, Skypi and D NES have made sure the site being used for the survey is both safe and effective. The survey requires a password, "BeTheManFS" and is case-sensitive, so make sure you type it exactly as it is written. One-Question Super Short Awesome Survey! We really want to know everyone's preferences so that we can try to sub B-Daman eS (and eventually the original B-Daman) as best as possible. We want everyone to enjoy the episodes to the fullest! So give your opinion, and help BeTheMan become a great subgroup! The raw version of episode two has been released. We're going to start subbing it tonight, so you can expect the subbed release soon! Let us know if you want us to post a link to the raw in case you can't wait for the subbed version. We were planning on starting episode two today, but the raw still isn't out yet. D NES and Skypi will start subbing the second the raw is released~ But until then, please be patient! On another note, we're really grateful to all the B-Daman fans who have been showing their appreciation for our subs. Thank you so much for letting us know how you feel. It truly is a powerful motivation when we hear from the people we are subbing for. So thank you to everyone who has sent us messages, emails, and comments on our sites. And thank you to the fans who have quietly supported us from their computers too! It makes us happy to see the download count for the first episode we subbed go up every day. Please continue to support us! We will continue to do our best to provide everyone with the B-Daman they deserve to see subbed! There have been some questions about whether we're going to sub the whole season of Cross Fight B-Daman eS. The Project Section has been updated accordingly. However, please understand that we do this during the little free time that we have, so although we managed to get the first episode of B-Daman eS subbed before the second episode was aired, this might not be the case for all of the episodes. For now, we will continue subbing B-Daman eS as they are released, and we will sub the original B-Daman episodes on the days we have free time, before the release of the next eS episode. Release: Cross Fight B-Daman eS Episode 01 Subbed! 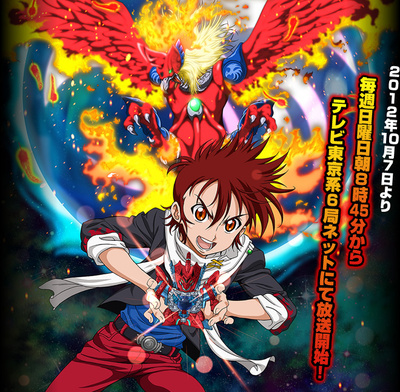 B-Daman eS Episode 01 SUBBED has been released! We have finally finished translating, editing, timing, and encoding, and we're proud to share our first subbed anime episode. B-Daman eS Episode 01 has been uploaded here, where you can download the torrent. It has also been uploaded to our Youtube account, for those of you who aren't too into torrents. (Skypi wasn't a big torrent user at first, but D NES opened Skypi's eyes to the world of 1080p). 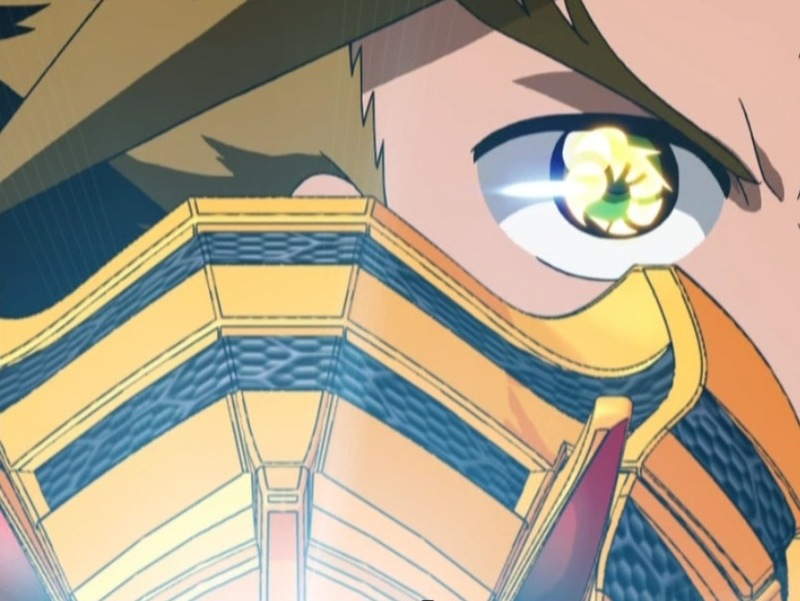 Enjoy the first episode of Cross Fight B-Daman eS! To anyone who's never seen B-Daman before, we just thought we'd let you in on a little secret. Although some terms and phrases are repeated, the main character of Cross Fight B-Daman eS is a newly introduced protagonist. Kamon Godai comes across our second main character, Garburn in the first episode. 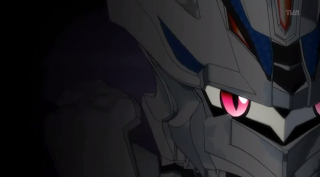 Although there are a few supporting/antagonist characters that had their places in the previous series, they are reintroduced in this series for any newly converted B-Daman fans. It's an interesting story about a boy who's simply trying to reach a goal with a friend. We can all relate to that in some way or another. D NES and Skypi are sharing the dream of forming a subgroup! So give B-Daman eS a chance when we release Episode 01 Subbed! The majority of the process is done, so we just wanted to update everyone on how close B-Daman eS Episode 01 Subbed is from being released! Raw has been obtained. Timing has been completed. And the video is almost entirely translated. We only have a few sentences towards the end, and the ending song (which is pretty good by the way) to translate. The songs are actually the easiest to translate, I think. Since we have been editing the subs as we go, much of the editing has been finished as well. Once the ending song has been subbed, we'll review it for any typos and timing issues. After that, it will be uploaded for everyone! We will announce it here when the episode has been released! Just wanted to let everyone know that BeTheMan Fansubs plans on conducting a few short one-question, anonymous surveys every once in a while to see what fellow animefans prefer when it comes to the anime they download/stream. This will help us develop our methods, and therefore our subs! We just finished creating the first survey, which is available to anyone who wants to participate! It's only one-question, and it does not require any personal information whatsoever. ^-^ We will be using a password to protect all future surveys from any irrelevant responses. The [case-sensitive] password is now, and forever will be: "BeTheManFS" Be sure to write it exactly as it is written here, or else you will not be able to participate! Thank you for participating in our first survey! Your responses will be very helpful to BeTheMan Fansubs! We are a new fansub group that has recently formed: BeTheMan! If you want to know about who we are, please click the "About Us" section. We are picking up Cross Fight B-Daman eS. You can find out as to why in our "Projects" section. We highly recommend the use of the linked website, as it easily tracks which animes and mangas you have read~ We use the site on a daily basis, so feel free to ask us any questions, or visit our pages to see what we've been watching/reading! Send us an email and we'll give you the link to our pages. We will be working on Cross Fight eS whenever we have the time, so we apologize for any less-than-speedy updates. There's only two of us, so do not expect timely releases, but we will do our best to have an episode out every week. However, if you're interested in knowing where we are in the process of subbing an episode, feel free to visit our twitter page, where we will be keeping any anime fans updated on how close we are to releasing the next episode. For now, the first episode of Cross Fight B-Daman eS is almost done, so we will upload it when it's been reviewed and edited for the final time. At BeTheMan Fansubs, we value grammatically-correct subs and work hard to never let anyone see any typos. For those of you who do not have a twitter, don't worry! We will still be posting on here to announce when any new episode has been uploaded. 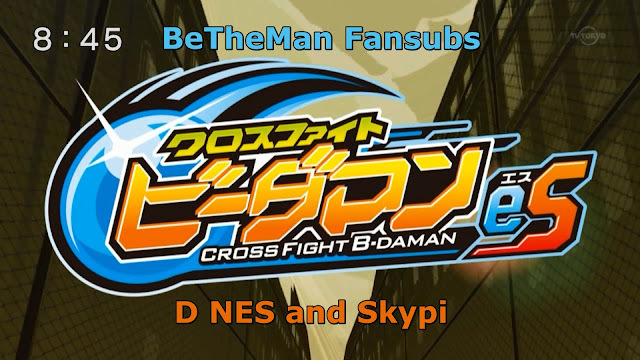 We hope you enjoy Cross Fight B-Daman eS and any other project we pick up throughout our journey as subbers! And always Be The Man!